Are you staring a fridge full of Thanksgiving leftovers right now? Did you stuff yourself full of rolls, mashed potatoes, sweet potatoes, stuffing and pie yesterday? We have so much in common! Maybe you’re also looking for a way to use up some Thanksgiving leftovers that’s on the light side and that does not feature 3 or more carb-filled sides? This Thanksgiving Leftovers Salad should just about hit the spot. This recipes makes enough vinaigrette for several salads. Store any leftovers in the fridge. Still want more carbs? Serve with warmed leftover rolls, or try rolling leftover stuffing into small balls and baking until crisp to serve on the side. Measure vinaigrette ingredients into a small bowl and whisk vigorously until combined. Adjust liquid by adding more orange juice or oil, if needed. Pile a healthy serving of greens on a plate. Top with shredded turkey, cheese and chopped pecans. 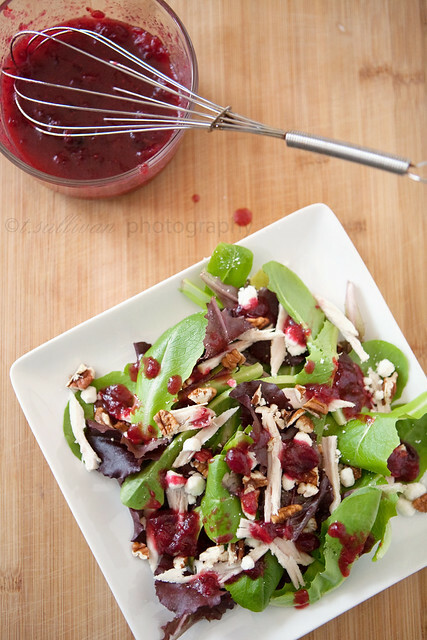 Drizzle with cranberry vinaigrette and serve. Mmm yes I think I’m going to need to eat this for the next three days straight before I start to feel at least a little less like a clogged artery. It sounds and looks delicious! That looks so crisp and refreshing… and it has goat cheese. I bet cranberry vinaigrette is awesome! I wonder how the dressing would come out with a jellied-type cranberry sauce? I think I’d really like the taste, but I prefer dressing to be smooth and thin. I think it would work just fine! The whole berry stuff is nice because you get pieces of cranberry in your salad, but if you’d rather have something smoother I don’t see why the plain jellied kind wouldn’t work just as well. Hi Craving Chronicles! Love your blog- looking forward to spending more time here!